Hot Melt provides a traditional look and is favoured for its excellent life expectancy and self healing membrane. What is Hot Melt Roofing? Hot Melt roofing systems provide a self-healing membrane created by applying a hot liquid directly to a prepared structural surface. It is a fully bonded monolithic system that can adjust to the shape of a building and create an effective waterproofing solution. It has a two layer bituminous rubber system, approximately 6mm overall thickness, with reinforced fleece between the layers, and needs a fully bonded felt layer over this. It is suitable for bonding with concrete, timber, brickwork and other materials, easily covering surface irregularities. We are approved installers of the leading Hot Melt roofing systems in the UK. IKO Permatec is a waterproofing system manufactured in the UK. It is melted and applied as a liquid directly to the deck in two 3mm coats to form a fully waterproof membrane. IKO Hot Melt is produced for longevity so it will last the life of the building on which it is installed. The flexible design can be applied around beams and posts and can withstand rain and frost as soon as it is applied. This makes Permatec an effective roofing solution that can be installed throughout the year. Alumasc Hydrotech offers long-term waterproofing and is favoured for its hardwearing performance. The Hydrotech MM6125 is made of 100% solids therefore it contains no solvents and does not require mixing. 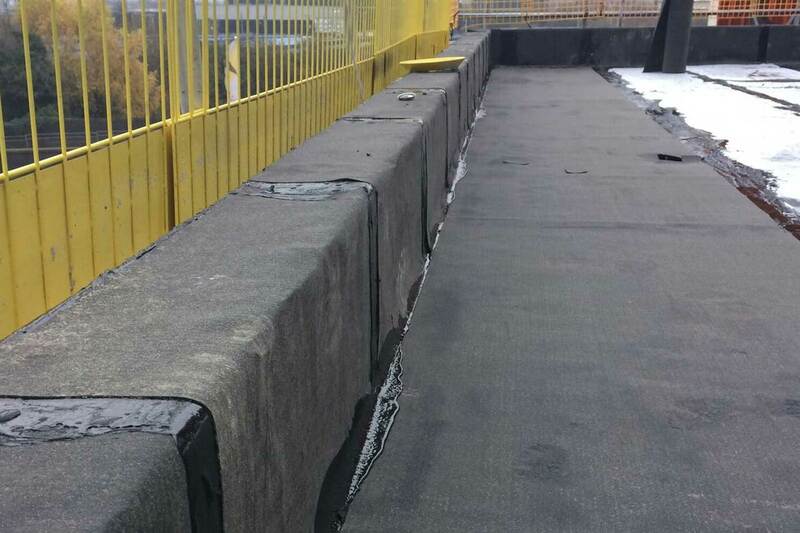 This lightweight waterproofing system is a self healing membrane that will only require minimal maintenance on routine roofing inspections. 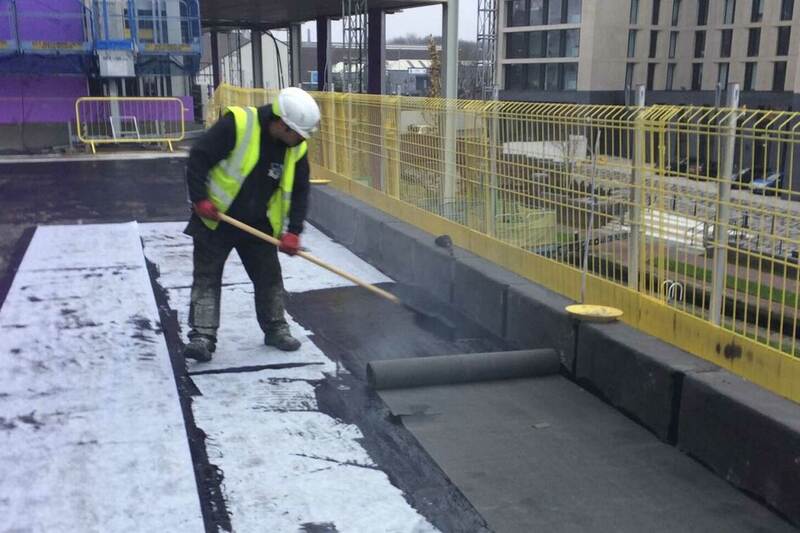 Like other Hot Melt waterproofing systems, Hydrotech can be laid at low temperatures suitable for winter installations. 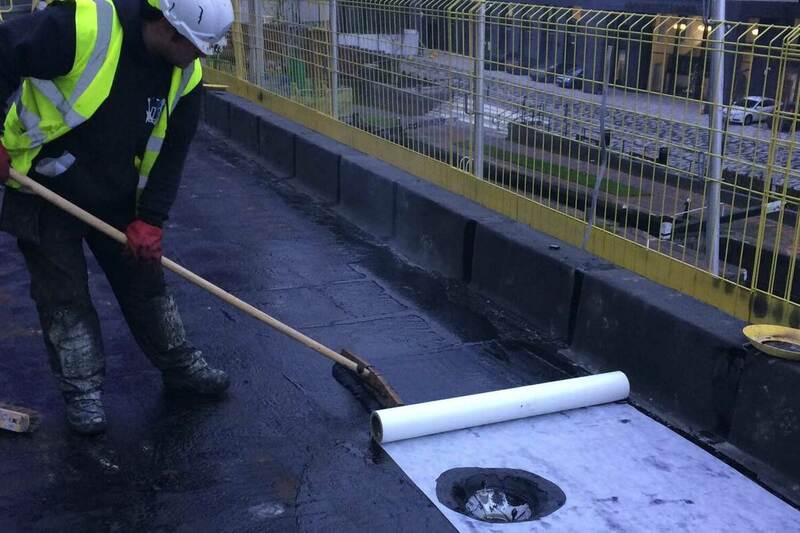 The Bauder waterproofing system uses 25% post-consumer recycled rubber and is ideally suited for installation on protected roofs such as inverted, paved, green roofs and ballasted surfaces. This seamless application is applied in 3mm layers of hot melt with a quick drying polymer primer. Bauder has the highest fire rating of F.AA. Hot Melt roofing products can only be applied by licensed contractors. 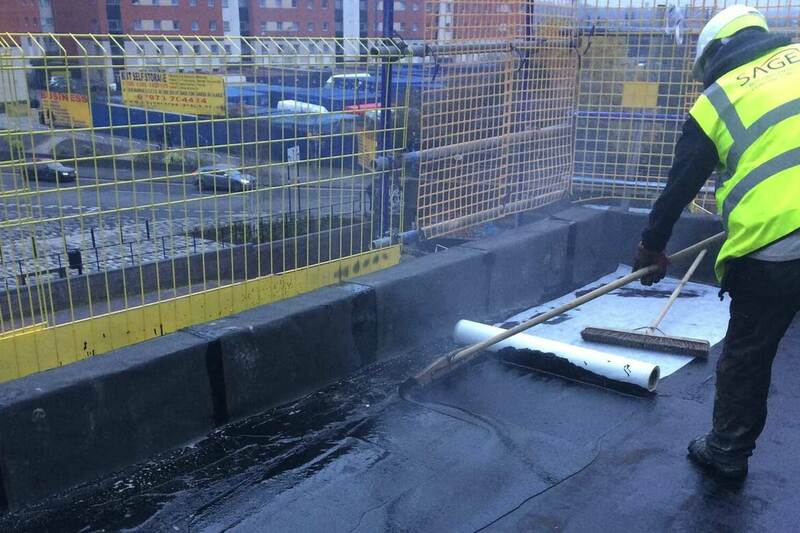 Sage BEC are specialist commercial roofing contractors with expertise in a wide range of materials and applications. What are the benefits of Hot Melt systems? Minimum up stand is from the top of a finished roof level, such as the top of a slab or pebbles, and should be 150mm minimum. This applies to all roofing systems, so plan in door and window sills. Debris or dust or chemical contaminants will cause system failure. Adequately protect the concrete from these, including mortar splashes and access routes to working area. We include sweeping clean in our costs but will charge for any other clean.